Home Latest News Chandigarh & Around Do You Know Petrol Prices Are The Highest In Last 3 Years? Do You Know Petrol Prices Are The Highest In Last 3 Years? The nation has been so gripped to Baba Gurmeet Ram Rahim Singh’s conviction and sentencing for past many days that we didn’t even notice where oil prices in the country are going. Petrol prices is hovering at the highest rate in last 3 years, and that of diesel, the highest in last 4 months. Since July, the petrol price has been hiked by Rs. 6 per litre and diesel price has increased by Rs 3.67 a litre. From June 2017, state-owned oil companies adopted the international practice of revising petrol and diesel prices daily as per rates in international market. Earlier for last 15 years, rates were revised on 1st and 16th of every month. HOW HAS BEEN THE TREND OF RATES? From May 1, 2017 the dynamic oil price revision was implemented on a pilot basis in 5 cities including Chandigarh. After successful results here, it was implemented across India. The three state-owned fuel retailers, Indian Oil Corp (IOC), Bharat Petroleum Corp Ltd (BPCL) and Hindustan Petroleum Corp Ltd (HPCL), revise the retail selling price (RSP) of petrol and diesel daily. According to Times of India report, the rates of diesel have seen many reductions on many occasions, but not petrol. Petrol prices has been on an upswing. Earlier any downswing in the rates was due to softening international oil prices but since July 3 been on the rise. 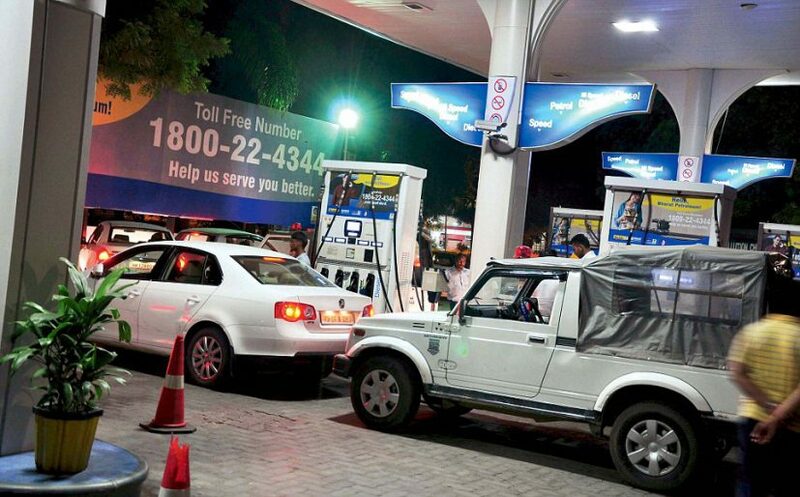 “Previously, everybody felt the pinch when rates would go up by Rs 2 or 3 per litre in one go. Now they are being increased by 1 paisa to 15 paise a litre everyday, hikes that have largely gone unnoticed,” a senior oil company executive said. WHAT IS DAILY OIL PRICE REVISION? ♦ The petrol and diesel rates in the country are revised every day. The prices are in sync with the prices of oil in international market. ♦ The practice of daily price revision or dynamic pricing is done in most countries. ♦ Earlier the rates were revised on 1st and 16th of every month. This practice began on April 1, 2002, when the auto fuel was deregularised and prices were based on average international oil price and foreign exchange rate in the preceding fortnight. ♦ Before 2002 oil deregulation, the government had the sole power to decide the fuel prices. ♦ When oil prices in the international market started to swell post 2004, the deregulation was found to the missing its objective. However, fortnightly revision continued, but the revision was not completely in sync with the required price increase. ♦ The oil companies constantly complained of losses and after much deliberations finally dynamic revision was brought in. ♦ The official said that daily price change will remove the big leaps in rates that need to be effected at the end of the fortnight, making the consumer more aligned to market dynamics.